The first CHIM station was started in Timmins, Ontario and was actually Canada's first non-commercial Christian radio station! Today the CHIM has expanded into a network of stations across Canada. Our vision is to see a Christian radio station in every city or town across Canada. We will go anywhere where there is enough interest. 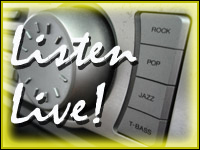 For more information on how to get a Christian radio station in your city or town, please e-mail Roger deBrabant. Thank you for your interest in the CHIM Radio Network, we hope you enjoy our site and come back often! You've requested it and now it's here: we are now streaming online! To tune into CHIM, click here. Please note: this stream works best when used through winamp or a similar player that supports acc & pls files. To download winamp, please click on the image to the right. The CHIM Radio Network is looking for a volunteer weather reporter. For more information, click here.